For Jorge Lorenzo, the 2014 season has been the worst start to a MotoGP championship. But things looked up for him at Mugello, when Lorenzo engaged in a highly skilled duel with Marc Marquez for the lead in the race. At the end of it all, it was Lorenzo who had to cede victory to Marquez, despite the fact that the both of them parried and sparred for a long time, trading places corner after corner. The fact that Marquez crossed the finish line first meant that he'd managed a clean sweep of the races held so far in the 2014 season - six wins of six races and the championship lead. Young Marquez really does look unstoppable. Saturday at Mugello was an indicator of exactly how exciting the race would be. Marquez had qualified on pole, with Andrea Iannone second and Jorge Lorenzo third. It was Marquez's sixth pole of six qualifying sessions this year, helping the Repsol Honda rider extend his perfect qualifying run. When the race got underway on Sunday at Mugello, it was Jorge Lorenzo who burst into the race lead, and controlled the pack from the front of the grid over the course of the first 17 laps. When Lorenzo ran onto the grass on the main straight it allowed Marquez to challenge for the lead. The pair of them traded places 11 times, in what proved to be an amazing spectacle for the many MotoGP fans at Mugello. 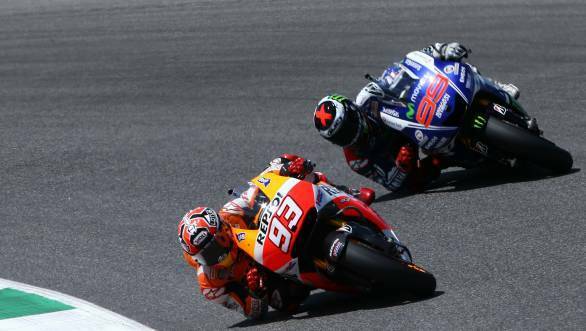 Ultimately it was Marquez who triumphed with a last lap pass that Lorenzo could not best. And while there was celebration from the Repsol Honda camp and the Yamaha camp, it was a sea of fluorescent Number 46 flags that were waved at Mugello with zest. Valentino Rossi had managed to finish third, despite the fact that he started tenth. The Italian 9 time champion charged into third spot on the opening lap and gradually reeled in the leading pair. Third place enabled Rossi to move into second spot in the championship standings, behind Marc Marquez and one point ahead of Dani Pedrosa. Finishing just off the podium was Marquez's Repsol Honda team-mate Dani Pedrosa, with Pol Espargaro finishing fifth, Andrea Dovizioso sixth for Ducati and Andrea Iannone seventh. Alvaro Bautista, Aleix Espargaro and Yonny Hernandez rounded off the top 10.